Distributor: Currently licensed by Sentai Filmworks, also available streaming on Hidive.com. Notes: The series was based on a number of novels written by Tanaka Yoshiki (Heroic Legend of Arslan). There is also a manga series based on these novels, with art by Michihara Katsumi. The company which owns the overseas license for Legend of the Galactic Heroes recently conducted a survey to see if there would be a market for a North American release of the series. As of 2013, no plans have been made to officially release this series in North America. In the distant future the democratic Free Planets Alliance and the Goldenbaum Empire are fighting a war that has been going on for over one hundred and twenty years. In the midst of the violence and chaos, two heroes emerge on separate sides of the conflict. 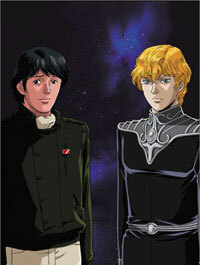 There are very few anime that have portrayed the nature of humanity as accurately as Legend of the Galactic Heroes. Although the action takes place in a fantastic setting the themes and analysis of civilization hit remarkably close to home. I went into this thinking it'd be a clone of Captain Harlock, but was blown away by this hidden gem that doesn't get nearly enough attention from the anime community. What really drives LoGH is a truly superb story. We're taken through a dense plot where everyone has an agenda to fulfill: some people just want to get by ... and others want to get by with everything they possibly can. An epic in every sense of the word; empires both rise and crumble, important people are lost, and our characters grow as the events unfold. Speaking of the characters, the most intriguing are our two main heroes. For the Alliance we have Yang Wenli, the obvious source material for Captain Justy Tylor. This amazing tactician joined the army so he could get free schooling - in all honesty, he would much rather see the war end so he could pursue his true dream of becoming a historian. Imagine MASH's Hawkeye in anime form and you basically get the idea. Yang is the source of most of the insight into human nature and philosophical musings of the series, and is laid-back to a fault. Oh yes, he's also the Alliance's greatest hope against the Empire somehow. Representing said Empire is Reinhard: much colder than his counterpart, but just as cunning. His insight is no less than Yang's, but his methods are certainly stricter. Reinhard's motivations, and even applications, can't be seen as evil though. His original purpose for becoming a soldier was to take back his sister who was forced into marriage with the Kaiser. Sick of the corruptness of the Goldenbaum dynasty, he wants enough power so that the people will no longer suffer from others' tyranny. To get by in a monarchy takes more than just a bit of manipulation though, and among wolves a sheep must grow fangs. That's not to say the rest of the cast is boring though - far from it. The story is conveyed through the eyes of literally hundreds, possibly thousands, of characters. From kings to normal townsfolk, head ministers and average guns men, we see how the actions of the characters affect those in the universe. Nobody is just a soldier or another face in the crowd - everyone represented has a story to tell, a background that affects his or her future decisions and LoGH does a wonderful job of painting a diverse picture of the universe. The animation is average, really nothing to write home about. Just about the only thing I can complain about is the large number of difficult to remember German names. This is no more difficult than adjusting to Japanese names for the first time though. The musical selection is decent. With the exception of the opening sequences the soundtrack is made up entirely of classical music. In many instances this can be quite dull (see the Crest of the Stars opening for an example), but they've used it very well here. The songs make appropriate accompaniment to the action instead of being the sole focus of our attention. If you want girls in skimpy clothes, giant robots, or a martial arts tournament I'd recommend looking elsewhere. If you want a well-thought-out drama with engrossing characters, stop here. Should you be lucky enough to have access to the episodes this is one you don't want to pass up. Recommended Audience: Most younger viewers wouldn't sit through a show like this. There is occasional on-screen violence in the form of bombings, assassinations, and other actions generally associated with political intrigue as well as battles between spaceships. A swear word or two might have slipped through as well: nothing horribly graphic.